Children are losing out on their funding entitlement because schools are holding too much money in reserve, claims a teachers' union. Schools in England held surpluses of £2bn at the end of the last school year show annual figures, an increase of almost 15% on the previous year. 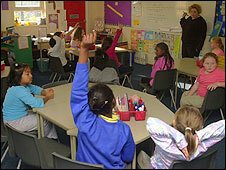 The National Association of Schoolmasters Union of Women Teachers (NASUWT) says this is "unacceptable". But head teachers say there is a lack of clarity that needs resolving.